Hey, Comic Impact readers and fan of action figures! Welcome to a new Figure Friday! A few weeks back I told you I was going to review the Marvel Universe Ghost Rider. Guess what? 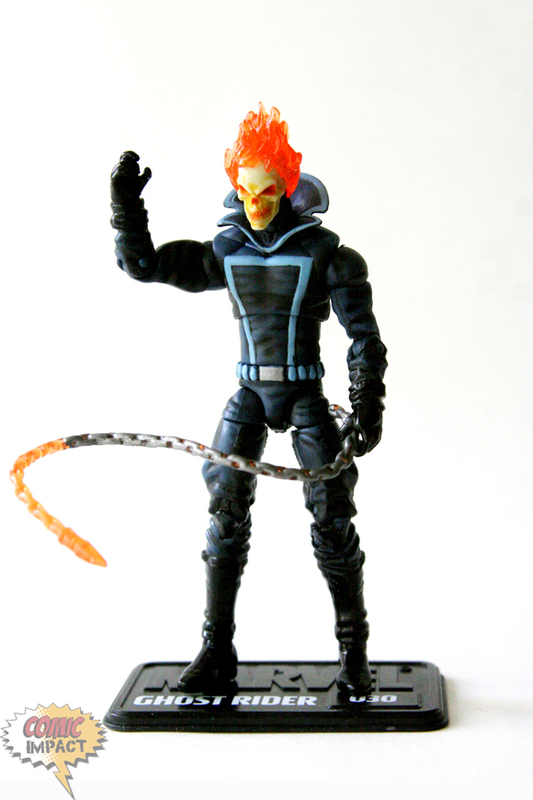 Now we’re back with an all new Figure Friday and this week going to take a look at the Marvel Universe Ghost Rider. I will admit I have not read a Ghost Rider comic in a long time. I do enjoy the design of this character. When I think of Ghost Rider I think of the 1990’s, reading his comics and listening to Megadeth or as Ken likes to call it every Thursday night. Driven to desperation by the impending death of his adoptive father, Johnny Blaze made a deal he would regret forever. His father was miraculously cured of cancer, only to die in a fiery wreck, and Johnny became the Ghost Rider. Barely in control of the demonic powers that coursed through him, he hunted evil men across the country. Whenever he could, he turned his powers to the greater good, but he never forgot that his fate was sealed. First off, THANK YOU Hasbro, for not making the figure look like anything from the Nicolas Cage film. They went with the comic book look. The first thing I noticed with this figure is the excellent sculpting on his head. The Rider is sporting his 1970’s look a blue jumpsuit complete with that very Marvel collar that even Iron Fist had in the 70’s. The blue paint is amazing as it goes from dark blue to a very light blue. I would even call it Dodger blue. The skull, which is his head, is a light yellow. It is not my favorite color for a skull, but it works. The flames on his head are an orange, semi-transparent plastic that is also in the eyes, mouth and nose. With the right light you can have some fun with it. Hasbro did it right, it looks like there is fire coming out of his head, just like the comics. I even like the small details they put on is gloves. He also comes with a hellfire chain accessory which makes him even more badass. Oh, a side note: this can make a great custom Deadman figure if you can find a way to take off the flames from his head. Ok, now on with the articulation! It has the standard for all new Marvel Universe figures the ball-joint hips that Hasbro has recently shown off in their newer figures. This guy is full of great poses and the joints themselves are also flexible but tight, making it very easy to create and hold poses. Yet, there is a something I don’t like about this figure. Like a lot of figures, he has a hard time holding onto his accessories. It’s really difficult to get Ghost Rider to hold onto his hellfire chain. This is a figure that both kids would enjoy playing with, and collectors can look at. I enjoy this figure a lot and as I was playing with him I thought to myself Maybe I need to go back and read the Jason Aaron Ghost Rider comics one day.Also, I would love it if Hasbro made a deluxe figure with his bike. Yet, this a great figure and I am happy to say he is part of my Marvel Universe that I own.